No current giveaways at the moment. If you're interested in sponsoring a giveaway, please contact us here. Win a Surf Trip to Sunny Mexico!! 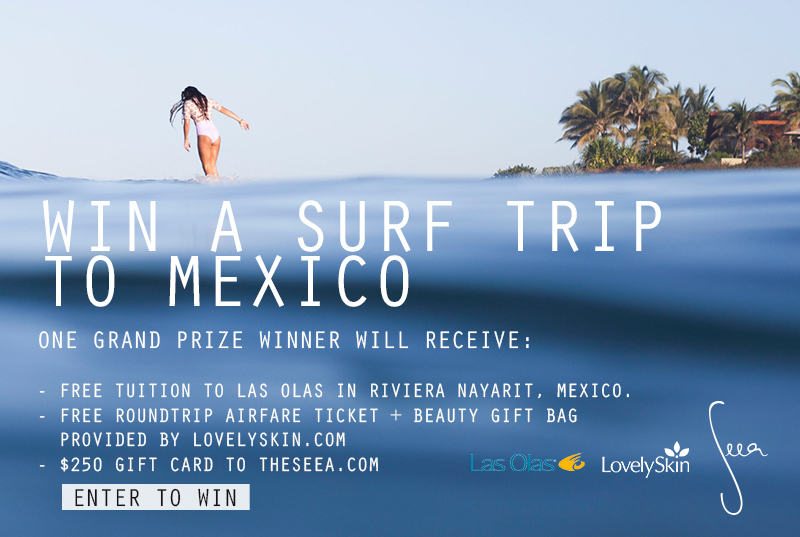 If you've ever imagined catching your first wave in Mexico's warm friendly waters, or just crave a week of pampering and surfing to recharge your soul, Seea, Las Olas Surf Safari and Lovelyskin.com have teamed up for a spectacular giveaway to make one lucky winner's surf vacation dreams come true! • Free tuition at Las Olas Surf Safari in Riviera Nayarit, Mexico. Includes a six day/five night surf safari, daily surf and yoga sessions, sports massage, daily breakfast, two dinners and lunch on excursion day and ground transportation valued at $2,995. • One roundtrip airfare ticket up to $800 and beauty gift bag provided by LovelySkin.com for personal pampering and sun protection valued at $250. • $250 gift card to theseea.com to spend on suits for your trip. Disclosure/Disclaimer JettyGirl is not connected with the "Win a Las Olas Surf Safari" Giveaway in any way. Complete Terms & Conditions are posted on the contest entry page at theseea.com. Walked outside today to discover the roses blooming and two copies of Tiffany Campbell and Andria Lessler's iconic women's surf film, "Dear & Yonder." Recently reintroduced with the gracious support of Mollusk Surf Shop, the film's 16mm footage rolls through a dozen beautiful locations that include Australia, French Polynesia, California, Indonesia, Mexico and even Arizona. Starring Sofia Mulanovich, Belinda Baggs, Stephanie Gilmore, Kassia Meador, Liz Clark, Rell Sunn, Prue Jeffries, Coco Ho, Ashley Lloyd, Linda Benson, Lee-Ann Curren, Ashley Davis, Lisa Anderson, Judith Sheridan, Silvana Lima, Chelsea Hedges, and Sally Fitzgibbons. The movie also covers an enticing list of historical surfers too long to mention. We can still remember the night we saw "Dear & Yonder" at La Paloma Theatre in downtown Encinitas. The lines were out the door and if it wasn't for some fancy maneuvering by some of the cast, we wouldn't have made it into the show. We didn't sit in seats that night, but huddled on the hard theater floor ...and the ensuing backaches were well worth it. 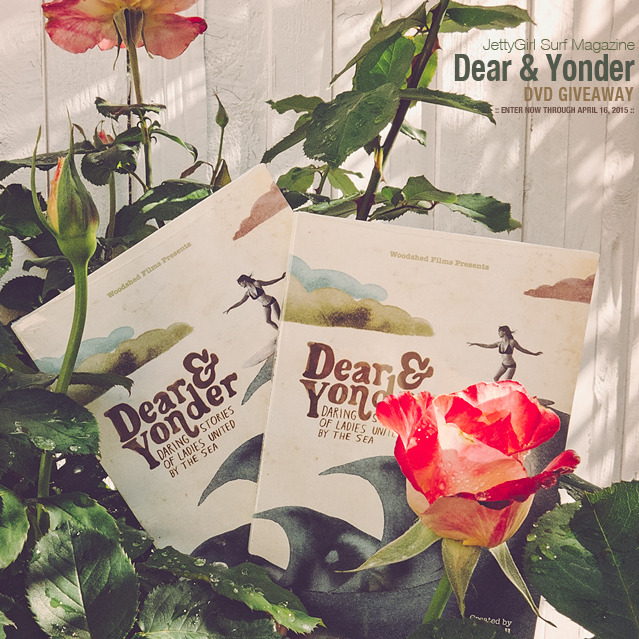 "Dear & Yonder" is a beautiful surf film and you now have two chances to grab yourself a copy. Entries: Enter the giveaway by using the form below. There are multiple ways to enter so feel free to use any or all of them. No purchase necessary to enter. Deadlines: The Giveaway runs from April 7, 2015 at 1:00pm PST to April 16, 2015 at 11:59pm PST. The two winning entries will be notified via email within 48 hours of the closing of the entry period. The winners will have 48 hours to reply or will forfeit their prize and another winner will be chosen. You've probably seen Jonesea Wetsuits being worn by team riders Lindsay Steinriede, Mele Saili, Makala Smith, and Malia Osterkamp. Here's your chance to win a brand new custom suit for yourself. 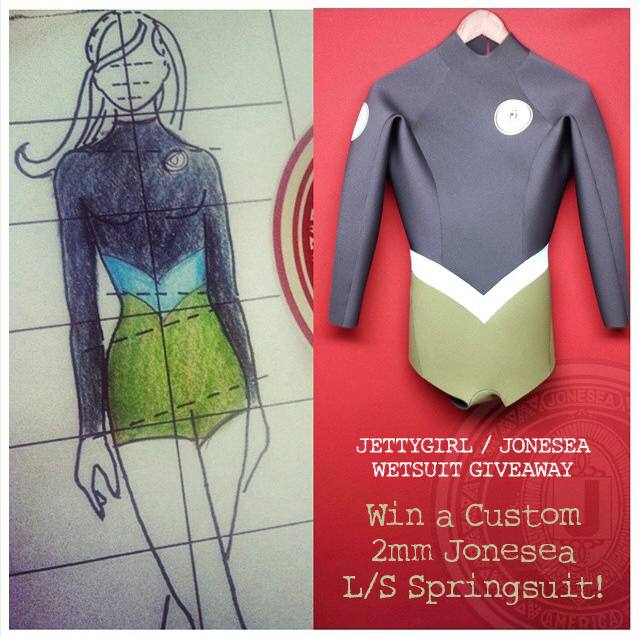 And when we say custom, we mean custom...some of the wetsuit colors available for the winning entry include black, charcoal gray, light gray, navy, baby blue, royal, magenta, pink, plum, lilac, olive, neon green, and gold. Imagine the possibilities. Entries: Enter the giveaway by using the form below. There are multiple ways to enter so feel free to use any or all of them. No purchase necessary to enter. Deadlines: The Giveaway runs from October 14, 2014 at 12:00am PST to October 22, 2014 at 11:59pm PST. The winning entry will be notified via email within 48 hours of the closing of the entry period. The winner will have 48 hours to reply or will forfeit their prize and another winner will be chosen. Best of luck to you!